Trey Supak does not have any MLB stats for the season. Draft: 2014, Pittsburgh Pirates, CBBth rd. Name is pronounced "SHOE-pock" ... 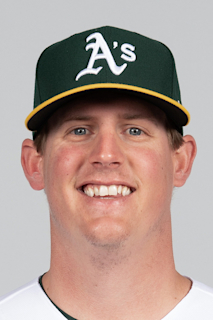 Graduated from La Grange (TX) High School, where he also played football and basketball ... Was the first player drafted from La Grange since pitcher Homer Bailey by Cincinnati in 2004 ... Committed to the University of Houston prior to signing with Pittsburgh ... His uncle, Jody, who was also a pitcher, was drafted by Detroit in 1987 ... Enjoys hunting and fishing.....follow him on Twitter (@treysupak9). Went 8-7 with a 2.48 ERA in 25 starts between Class-A Carolina and Double-A Biloxi ... His 2.48 ERA and 123 strikeouts ranked second in the Brewers organization ... Held opponents to a .223 batting average ... Began the season at Carolina, where he went 2-1 with a 1.76 ERA in 9 starts ... Was a Carolina League All-Star ... Was promoted to Biloxi on 5/26 and went 6-6 with a 2.91 ERA in 16 starts ... Went 0-6 with a 5.22 ERA over his first 8 starts with Biloxi (39.2ip, 23er) and 6-0 with a 0.96 ERA over his last 8 starts (47ip, 5er) ... Was named Southern League Pitcher of the Week for 7/23-7/29 after going 1-0 with a 1.38 ERA in 2 starts (13ip, 8h, 4r, 2er, 3bb, 12k) ... Did not allow an earned run in his last 3 starts, surrendering just an unearned run in 18.0 innings ... Was added to the 40-man roster on 11/20. Went 5-6 with a 3.57 ERA and 1 save in 23 games (18 starts) between Class-A Wisconsin and Class-A Carolina.....held opponents to a .212 batting average ... Began the season at Wisconsin and was promoted to Carolina on 5/29. In his first season in the Brewers organization went 3-4 with a 3.24 ERA and 1 save in 15 games (8 starts) between Rookie Helena and Class-A Wisconsin ... Began the season at Helena and was promoted to Wisconsin on 7/10. March 11, 2019 Milwaukee Brewers optioned RHP Trey Supak to Biloxi Shuckers. November 20, 2018 Milwaukee Brewers selected the contract of RHP Trey Supak from Biloxi Shuckers. August 15, 2018 Biloxi Shuckers activated RHP Trey Supak from the 7-day disabled list. August 8, 2018 Biloxi Shuckers placed RHP Trey Supak on the 7-day disabled list retroactive to August 4, 2018. May 26, 2018 RHP Trey Supak assigned to Biloxi Shuckers from Carolina Mudcats. May 29, 2017 RHP Trey Supak assigned to Carolina Mudcats from Wisconsin Timber Rattlers. July 10, 2016 RHP Trey Supak assigned to Wisconsin Timber Rattlers from Helena Brewers. June 17, 2016 RHP Trey Supak assigned to Helena Brewers. June 21, 2015 RHP Trey Supak assigned to Bristol Pirates from GCL Pirates. June 14, 2014 Pittsburgh Pirates signed Trey Supak. June 14, 2014 RHP Trey Supak assigned to GCL Pirates.